Dogs up to 5 Kilos: 0,5 ml Pipette; Dogs from 5 to 10 Kilos:1 ml: Pipette; Dogs from 10 to 25 Kilos: 2,5 ml Pipette; Dogs from 25 to 40 Kilos: 4 ml Pipette; Dogs weighing more than 40 kilos; 6 ml Pipette. Parasitic with topical action and environmental effect, for dogs. Repels and kills mosquitoes, ticks, fleas and lice. 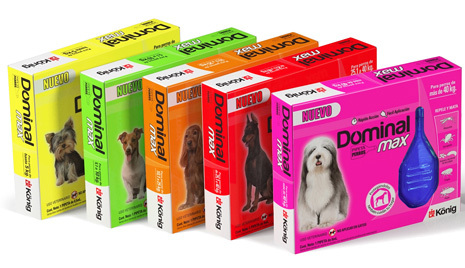 Dominal MAX Dogs is a solution used for topical flea control on dogs, with added environmental effect. Dominal MAX Dogs contains Imidacloprid, Permethrin and Fenoxicarb. Imidacloprid is characteristic for its powerful dumping power, responsible for the elimination of 100% of the fleas within 24 hours post-application. Permethrin incorporates tickcide action and Fenoxicarb adds residual power, due to an analogous action to that of the juvenile hormones of fleas, preventing their eggs and larvae from maturing and eliminating them from the environment, without resorting to additional products. Dominal MAX Dogs protects from reinfestations by fleas and ticks. Every 100 mL contains: Permethrin 45 grams; Imidacloprid 10,0 grams; Fenoxicarb 0,5 grams; Auxiliary agents q.s. Prevention from, and treatment of: fleas, tick and lice infestations. It repels flies and dirofilariasis (heartworm) transmitting mosquitoes. Remove the pipette from the pack. Maintain in a vertical position with the tip upwards and bend same with your fingers, breaking it off. Separate the animal’s hair at the nape of the neck and apply the total contents of the pipette directly onto the skin. For dogs weighing more than 25 Kilos, it is advisable to apply on two or three spots, parting the hair along the lumbar spine. Do not apply on cats.